The latest sign of change will come Saturday, when leaders of the long-time enemies are due to meet for the first time since 1949, when China's civil war ended and the then-ruling party, which lost, fled to Taiwan. Since then, Taiwan has asserted itself as an independent democracy. But China insists the island is a renegade province. It's one complicated relationship, but in a nutshell, they're "frenemies." 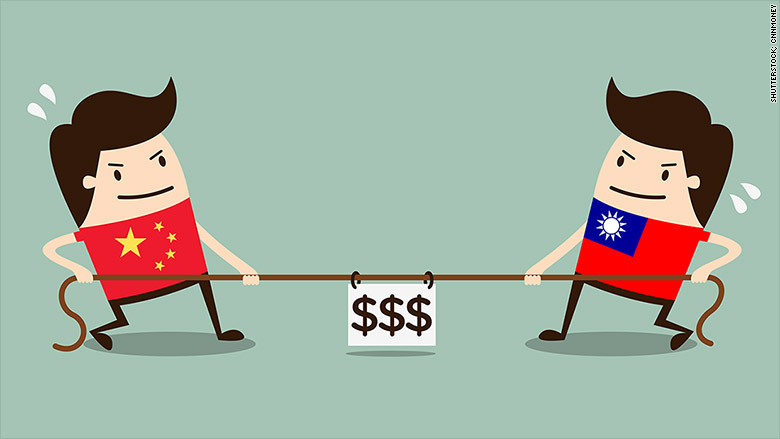 Despite protests from hardliners, China is Taiwan's top trade partner, accounting for about 40% of exports or roughly $130 billion a year, according to the Taiwanese government. Trade has ballooned from about $8 billion in 1991. Tourism on the island has also boomed since more direct flights began operating between China and Taiwan in 2009. Taiwan even increased the number of mainland visitors it allows. Meanwhile, Taiwan has provided China with plenty of investment dollars, funneling nearly $11 billion in 2012 into key sectors, including technology. This close relationship means the health of both economies are intertwined. Already, Taiwan's economy has taken a hit as growth slows in China. In the end, Taiwan, like the rest of the world, has little choice but to engage with China, the world's most-populous country and second-largest economy. Take the example of Foxconn and Pegatron, both major Apple (AAPL) suppliers with big factories in China. Or Acer, known for its laptops and netbooks, which also has plants in the mainland.